The Innovation Schools Act of 2008 allows leaders in district-run schools to explore ways to innovate within a public education bureaucracy. In the hands of strong leaders and in the context of earned autonomy, innovation status can serve as a fulcrum for both school-level innovation as well as systems-level improvements. 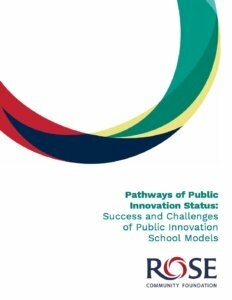 “Pathways of Public Innovation Status: Successes and Challenges of Public Innovation School Models” explores lessons learned from case studies and research on innovation school and innovation zones practices and policies.